KIEV, Ukraine -- Ukraine will hold a new round of talks with Russia, and perhaps with Kazakhstan, to prevent any trade restrictions once Kiev signs a free trade agreement with Brussels, Prime Minister Mykola Azarov said Wednesday. Azarov spoke at a government meeting a day after Russian President Vladimir Putin had suggested that such talks would make sense. "This position of the leadership creates a constructive basis for negotiations,” Azarov said at the meeting. Putin, who repeatedly warned Ukraine of serious economic and financial consequences if it signs the EU free trade agreement, had suddenly changed his tone on Tuesday. He said the move was not likely to cause any political problems between the two countries. Russia’s willingness to engage in the talks is a new twist after Russian Deputy Prime Minister Igor Shuvalov said in August it was “pointless” to continue further negotiations. Kiev, which wants to sign the free trade and political association agreements with the EU at a summit on November 27-28, also seeks to maintain massive trade with the Moscow-led Customs Union. Belarus, Kazakhstan and Russia are the founding and the only members of the Customs Union, which is supposed to be later renamed as the Eurasian Union. Azarov, who was in Minsk on Monday, managed to persuade Belarusian leader Alexandr Lukashenko to accept Ukraine’s pro-European path and said the countries set up road map for trade consultations. 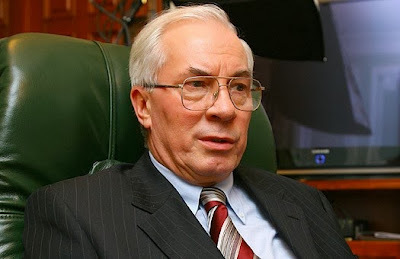 “The same scenario of cooperation we want with Russia and Kazakhstan,” Azarov said. Building the Eurasian Union, modeled on the EU, is Putin’s life-long dream that may allow Russia to maintain global relevance along with the U.S., EU and China. But that dream may be dashed if Ukraine joins the European path. “For Putin the growing readiness of Ukraine to turn to Europe despite the formidable costs of this decision is a real disaster,” Lilia Shevtsova, director of the Carnegie Moscow Center, wrote in her blog. “Eurasia simply cannot exist without Ukraine,” Shevtsova said. “It would not be an exaggeration to say that Ukraine running away from Moscow will mean a devastating blow to the resilience of the Russian ‘state-civilization’ that Putin tries to build,” Shevtsova said. “Ukraine’s ability to embark on its new path will have not only geopolitical, but tremendous civilizational implications,” Shevtsova said. “In case it succeeds, it can become a role model for the rest of Eurasia,” she said.